Yuki Beppu originally from Japan, attended the Art Ballet Naniwatsu Ballet School before studying in the Balletschule fur das Opernhaus, Zurich, Switzerland. Ms. Beppu has won many awards in Japan including first place in the Osaka Prix Competition in 2008. She danced for K-Ballet Company in Japan before relocating to the U.S. to dance with Atlantic City Ballet and Arts Ballet Theatre of Florida where she has danced solo and principal roles in The Nutcracker, Peter and the Wolf and Jaconda and Climpt. At Eugene Ballet, Yuki has danced principal roles in The Nutcracker, The Sleeping Beauty, A Midsummer Night’s Dream, Carmina Burana and Mowgli, the Jungle Book ballet. 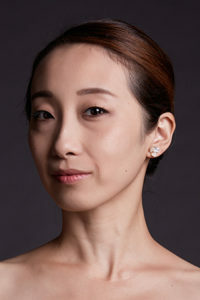 Yuki created the role of Gerda in the world premiere of Toni Pimble’s, The Snow Queen and Solveig in the world premiere of Toni Pimble’s, Peer Gynt.